Elizabeth Glover and her family have presented a cheque for almost €7,000 to St. James’s Hospital. The donation represents sponsorship and funds raised in connection with a headshave night and raffle held at The Laurence Lounge in Ballyfermot in February. As well as Elizabeth’s own head, two friends volunteered also to have their heads’ shaved and, in the end, Elizabeth said ‘lots of heads were shaved for St. James’s!’. Elizabeth, a patient of St. James’s Hospital, said she was thrilled with the outcome: “People were so generous to us; people gave wonderful raffle prizes and were so generous with sponsorship”. 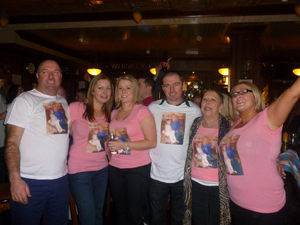 She paid particular tribute to The Laurence Lounge for their generous contribution, and to her daughter Susan. St. James’s is the largest single provider of cancer treatment inIreland and is the largest national centre for radiotherapy service. A major new government funded Cancer Care Centre and Radiation Oncology Centre is now open on the site and a facility for PET imaging for advanced patient diagnosis is open – the first such facility within a public hospital in Ireland.